The discovery of metal-organic frameworks, MOFs, has represented a revolution due to its multiple structural possibilities for the design of catalysts. In order to address the new possibilities of these materials, the prestigious scientific journal Chemical Society Reviews has published a special issue in which researchers Antonio Sepúlveda and Enrique Ramos, from the University of Alicante.Department of Inorganic Chemistry and the Advanced Materials Laboratory (LMA) have participated. 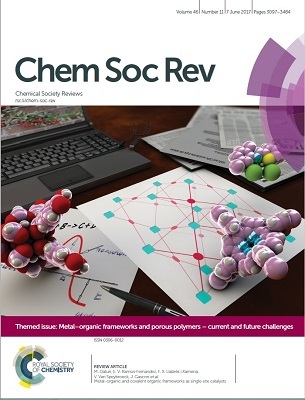 Their article “Metal–organic and covalent organic frameworks as single-site catalysts”, in which the possibilities of these materials as catalysts with a single active centre are approached, has been chosen for the front cover. In particular, the second top rated publication in chemistry worldwide, and the 30th most impact indexes in all areas of knowledge, has invited the world's largest experts in MOFs, COFs (Covalent Organic Framework) and porous polymers to bring in their vision regarding the future development of these materials and their applications. "Only eight contributions from the University of Alicante have been published in that journal so far but none has managed to be on the front cover," UA researchers explained. "This article is the result of the collaboration of five research groups from four different countries: the University of Alicante (Spain) and Ghent University (Belgium); the Delft University of Technology (Netherlands), the Institute of Chemical Technology (ITQ) in Valencia and the National Center for Scientific Research in France," they added. Catalysis is a field of study that involves many areas such as organometallic chemistry, surface chemistry and materials science. In fact, almost all the manufactured processes of agrochemical, petrochemical and pharmaceutical products use catalysts, that is, compounds that increase the rate of chemical reaction. MOFs have unique properties and are very interesting from the chemical and structural viewpoint to look for novel applications. According to UA researchers, "there are many types of active centres in a conventional catalyst that can be useful for the result we are looking for; however, others do not. With these new materials we can design the catalysts directly with the active centre that is useful for the reaction we are looking for." "We have managed to make progress in the design of very well defined catalysts with a single type of active centre, so that they become more efficient and clean, taking full advantage of raw materials and reducing by-products during the catalysis process. In short, from basic science, the goal is to move forward in this sector to reduce the synthesis and obtain compounds with new properties and a high added value", Antonio Sepúlveda and Enrique Ramos said. The group of researchers in the UA Advanced Materials Laboratory, world leader in catalysis, adsorption and porous materials, has been working for more than three years to develop substances with new properties, such as MOF, for well defined catalysts. Their applications range from the transformation of one compound into another in a very selective way, to adsorption for the separation of gases, elimination of pollutants and control of all kinds of chemical properties. "The important thing is that through the different processes of synthesis we can design the structure and the active sites, fundamental aspect for any application in catalysis or adsorption", they stressed. At present, they are participating in several national projects and in an industrial project for the development of MOF materials. The latter corresponds to a project financed by the Centrer for Industrial Technological Development (CDTI), in collaboration with the multinational Reyenvas, a leading company in the field of plastic transformation with a large catalogue of highly specialised products in the agricultural, packaging and construction industries.